Lights down, film starts rolling, action. 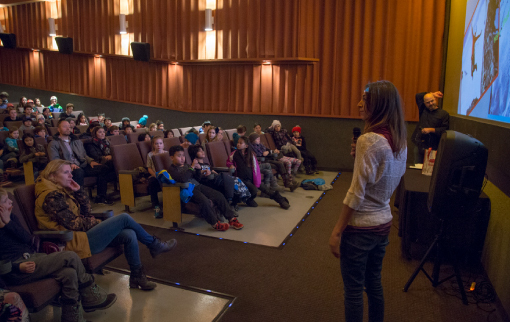 “To The Top”, a 5:33 minute film produced by Banff local Colin Harris – set entirely in Banff National Park and starring four students from Banff Elementary School – held its exclusive Premiere on Friday. The film was the lead feature of a specially-curated, mini film festival – presented by Take Me Outside and Banff Lodging Co.’s private foundation, the Wim & Nancy Pauw Foundation. 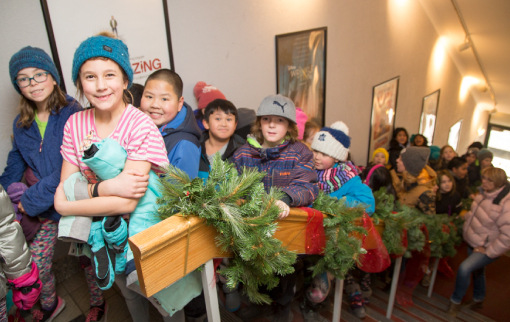 In its first year, the free-to-attend film festival was created especially for the older students of Banff Elementary School and had a clear message: get outside, make the most of winter adventures, and be safe-smart when outdoors in the Park. Held between 1pm-2pm at the Lux Cinema, the guest list was exclusive to Under 12s, with 150 Grade 4-7 students lining up patiently outside until the screen doors opened and they were able to take their seats. Following a warm welcome and introduction of the film by Emcee Jeff Mitchell, volunteering his time to host the festival, it was time for “To The Top” to start. Opening with the sounds of a cold winter morning in Banff, set to dramatic footage of mountain peaks contrasting with quiet residential streets, the narrative of “To The Top” starts with its four main characters: committed local tobogganers preparing for a day of action-packed adventure outdoors. Timed to an upbeat soundtrack – similar to what you’d expect from the latest high-production ski flick – the viewer sees the adventurers pack up their supplies, wax their boards, adding their layers and winter gear, and then hiking to their meet point – Banff’s pedestrian bridge. The film then follows its protagonists throughout their day, taking in the action of their tobogganing runs and closing with a celebratory campfire and s’mores feast. The stars of the film are Maggie O’Connor, Jon Williams, Ignacio Alvarez-Zegarra, and Maria Ines Valdez Castillan, who were recognized by Producer Colin Harris and received a loud applause from the audience. To The Top. Produced by Colin Harris, Executive Director, Take Me Outside. With “To The Top” drawing to a close, the Emcee hosted a series of fun trivia games based around local knowledge and outdoor sports, to win a selection of prizes. Some lucky students also discovered complimentary Lux Cinema tickets underneath their seats, adding to the excitement of the afternoon. 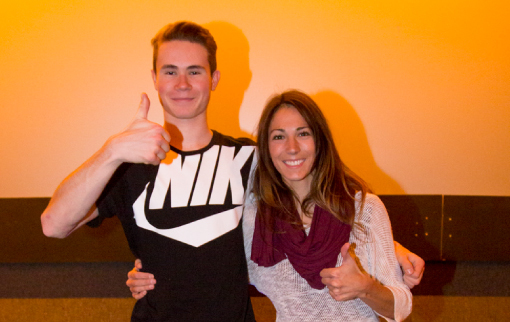 It was then time to introduce two VIP guests to the front of the screen: expert snowboarder Audrey Herbert (29) – who is this season competing again in the Freeride World Tour after finishing 4th in the world last year – and talented freeskier Nikolas Worobey (16), who can make the most technical tricks on the terrain park look a breeze. Both Nikolas and Audrey are members of the Youth Sport Fund, a program of the Wim & Nancy Pauw Foundation to support young Bow Valley athletes that have progressed to a competitive level, with annual funding to offset the costs of travelling to competitions, equipment and training. Pauw Foundation athletes, Nik Worobey and Audrey Hebert spoke to the students about goals, having fun, and staying safe. The two Banff-based athletes took to the floor to speak about their bright careers in snow sports, competing on the world stage, how they got to be where they are now, and also sharing their advice and top tips for staying safe while having fun in the snow. Both Audrey and Nikolas also opened up the floor for questions, including one from a curious audience member who wondered how Nikolas “gets so much air when he jumps”. The festival closed with another screening, the latest film from SkiBig3. 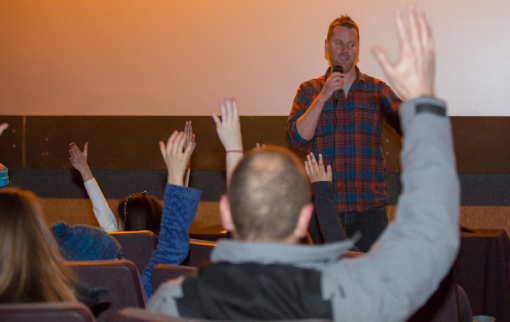 Produced by Sherpas Cinema and featuring the original words of Canadian spoken word artist, Shane Koyczak, the young audience watched in silence as “Look Up” filled the screen. 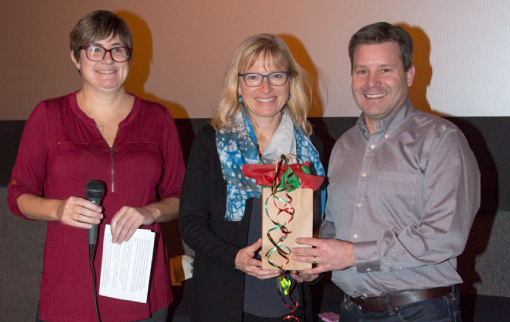 The film festival was the idea of Colin Harris, Recreation Initiatives Coordinator at the Town of Banff and Founder of Take Me Outside, and Cathy Geisler, Fund Director of the Pauw Foundation. Developed as a fun way to share the important messaging of having fun outdoors to Banff youths and recognize the participation of the four students starring in the film, the festival was created in partnership with Banff Elementary School. As funding supporter of Banff Elementary School’s “Nature Explorers” and “Outdoor Pursuits” programs – both of which encourage learning outdoors and the enhancement of the classroom curriculum with various mountain activities – the Pauw Foundation took the opportunity during the film festival to present Banff Elementary School’s Principal, Debbie McKibbin, with a cheque for $31,000 – for continued funding of the outdoor-related programs. “We love to see our local children and youths outside and being active, making the most of the Park we live in,” says Cathy. Take Me Outside is an organization committed to educating and creating awareness with Canadians, about our connection with nature and our time spent outside. Take Me Outside works with partner organizations, schools and education boards to encourage children and youths to spend more time outside. In 2011, Founder of the organization, Colin Harris, raised sponsorship funds for Take Me Outside’s initiatives by running across Canada. During this time, he visited many schools across the provinces and talked with more than 20,000 students about the importance of being outdoors, being active and connecting to nature. For further information about the Wim & Nancy Pauw Foundation’s Youth Sport Fund, see here.